Bubble sort is a simple sorting algorithm that is simple to understand and is usually taught to new students. However, it is not a very efficient algorithm and thus, not used in productive programs. The algorithm's name derives from the fact, that the elements “bubble” up to their designated index, resembling bubbles in a glass of sparkling mineral water. The algorithm compares couples of elements within a vector. The elements constituting pairs are next to each other. 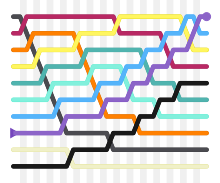 Starting at one end of the vector, pairs are sequentially assumed. That means for example, the first and second element are compared, then the second and third element, and then the third and fourth, and so on. If the current pair is out of order, its elements are swapped in place. This process – of comparing two elements – is done over and over again, until the vector is sorted. The vector is sorted, when no pairs had to be swapped. In the best case, the vector being sorted, the algorithm's complexity is O(n) (Big O notation). In the worst case, the vector being reversely sorted, O(n²). Starting at one end, consider every neighbored pair of elements in a vector one after another (in their order). If a pair's elements are out of order, swap them, and clear the flag sorted. Repeat the previous steps until sorted remains set. This page was last changed on 4 April 2019, at 03:11.